Made in 2018, filmed in Russia. 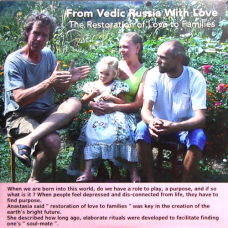 The film looks at some of the thousands of families in Russia that have chosen to give up modern living and live in harmony with nature, growing all their own food in a family setting. When we are born into this world, do we have a role to play, a purpose, and if so what is it? When people feel depressed and dis-connected from life, they have to find a purpose. Anastasia said,"restoration of live to families" was key in the creation of the earth's bright future. She described how long ago, elaborate rituals were developed to facilitate finding one's " soul-mate ".